THEY’RE a pretty laid back mob in Queensland and that is some of the charm (and sometimes the frustration) of the place. The Baroness of Balmain, the Baronets (Miss Gob and DJ Hoot), and I spent our Christmas and New Year up in hot and sunny Brisbane and on our last night dined with family way up in Brisbane’s northern suburbs where we were staying as guests of The Broker and The Forwarder. On our last night we decided to shout the family for one more shin dig at Lomandra’s which was just up the road from The Broker and The Forwarder’s nest. We were also joined by The Matriarch of Griffin. 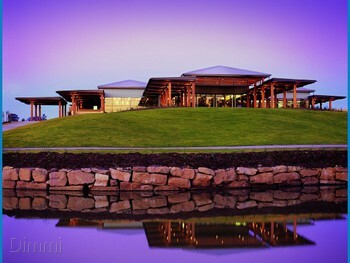 Lomandra’s is set among the lush and picturesque greens of the North Lakes Golf Club and is really the only “finer dining” option in North Lakes. I say “finer dining” because like many Queensland restaurants it offers a decent innovative a-la-carte menu in a laid back atmosphere as opposed to casual Queensland dining where you could get away wearing thongs (Southerners beware the Queensland dress code etiquette: formal one day – casual the next). It is named after a native Australian grass that grows quite well in Queensland and the open restaurant space has floor-to-ceiling windows with an outlook over the fairways. I wouldn’t call it intimate (as you have the long bar to one side of the dining area) but it has a bit of panache to it and prides itself on offering a menu that caters for all dining occasions. On the Friday night we dined we were also entertained by the vocals of Jared Alexander (who actually recognised The Broker form another colourful life). Lomandra’s versatile menu literally offers something for everyone as the menu has cafe options followed with bistro options and finally for the evenings a restaurant a la carte menu (including degustation option). One marvelous aspect is that there also are a lot of gluten-free and vegetarian dishes available which are identified accordingly (well done, Chef, should be more of it in other restaurants!!!). I was also impressed with the wine list. It offered something for those who wanted to celebrate with pizzazz, dine in style or have a glass of a quaffer with their burger. A nice touch was that the main courses also recommended a wine to accompany the meal – something that I thought would be taboo in outer suburban Brisbane. Orders are placed at the bar area. Some diners may frown upon such a convention but what Lomandra’s may lack in table service it makes up for with its vast menu and one of the better wine lists I have seen in a club. The Baronets always have a sparkle in their eye when they see a kids’ menu with the word “hamburger” on it. 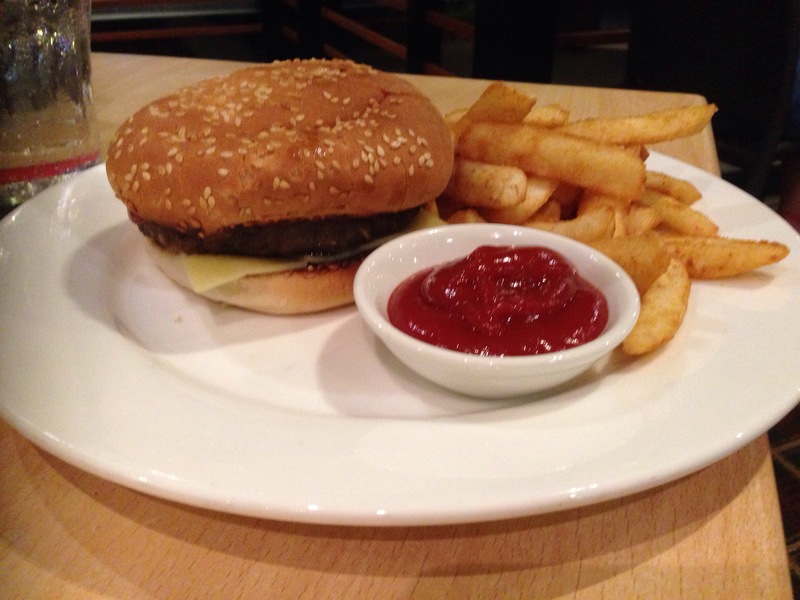 Lomandra’s kids’ menu has three choices and all for $9: fish & chips with salad; chicken breast with chips and salad, cheeseburger with chips and salad and for dessert, ice-cream with a choice of toppings for $3.50. Each meal comes with a fun pack which was something initially forgotten by our waiter but as Miss Gob always reads the fine print she inquired about it and the pack with puzzles and crayons appeared. The burger was huge compared to the kids’ servings we have had of late and came with chunky chips (but there wasn’t any salad). I though it was a bit too perfectly rounded to be produced in kitchen and it had a slight processed flavour to it (sorry chef if I got that completely wrong) but I don’t care – kids’ love it and it would satisfy the hungriest of them. Gob and DJ Hoot ate it all and gave it a 4 out of 5. For the grown ups the entrees offered wild mushroom and Parmesan infused risotto arancini ($9); home-made pork wonton with a ginger and soy dipping sauce ($9), home made Thai fish cakes with a nam jim dressing ($12); home made falafel served with humus and a marinated Greek yoghurt and mint-infused sauce ($9). We skipped entrees and just went for main courses: Baroness and The Matriarch ordered Lomandra’s signature twice-cooked pork belly served with a sweet potato puree, seared Hervey Bay scallops, bok choy, sea salt dried crackle and an apple & cherry glaze ($32); The Broker and I ordered the coal-roasted beef tenderloin served with smoked potato rosti, roasted baby carrots , prosciutto, petite carrot salad & red wine jus ($35); and The Forwarder decided to go it alone and have the marinated lamb rump served with Mediterranean-filled eggplant, bubbaganoush, seasonal green beans, roasted chickpeas and lamb jus ($32). We also got a side of beer battered fries with aioli ($6) and some steamed broccolini with roasted almonds ($7). 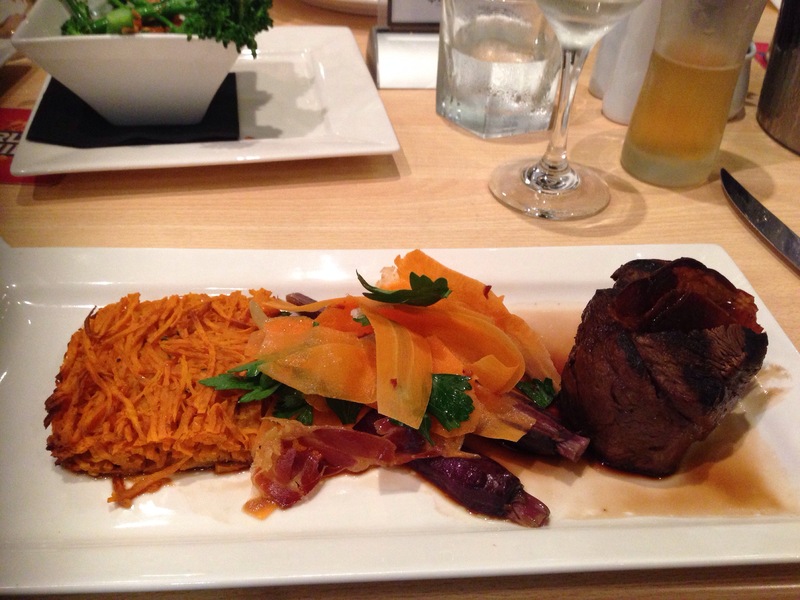 My beef fillet was a nice-sized lump of meat cooked medium. The Broker found that the potato rosti was far too smoky – I tend to agree. A slight smoke would have really complemented the coal-roasted char of the beef but it was a bit too overpowering (I tend to think that liquid smoke may have been added to the rosti mixture – not a bad additive if used sparingly). Overall it was a good serve with the jus being a good reduction to accompany the beef. The only fault was that the smoke of the rosti tended to dominate the palate which distracted from the flavours of the beef. 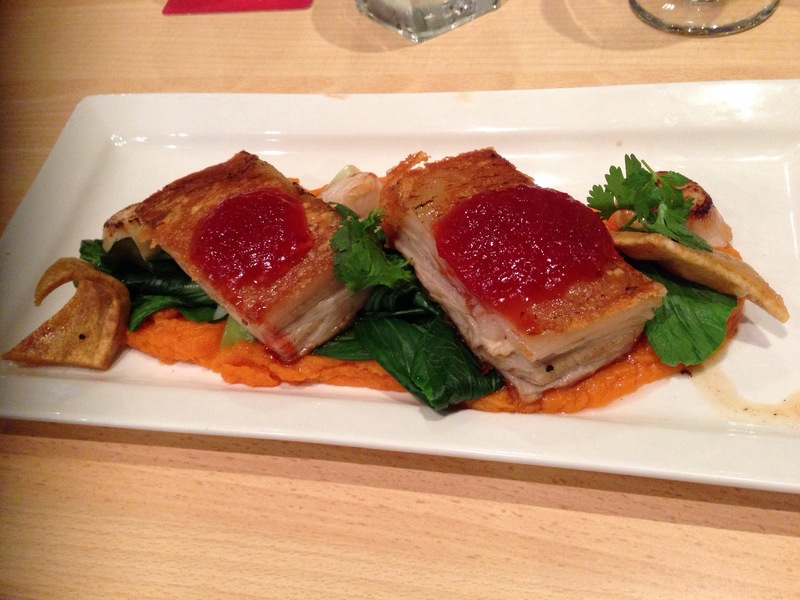 Baroness and The Matriarch – tempted by the inclusion of scallops – were presented with a vibrant and good-looking pork belly dish. It was a case of now you see it, now you don’t – the plates were almost gleaming within a flash. The three scallops were seared well thus retaining their tenderness, and what I tasted of the pork belly it was certainly the dish of the night – the crackling top was superb, the pork juicy and tender and the apple and cherry “glaze” a combination that did the pork proud. The Forwarder’s eyes popped out upon seeing the size of the purple eggplant that was a feature of her Mediterranean-inspired lamb dish. 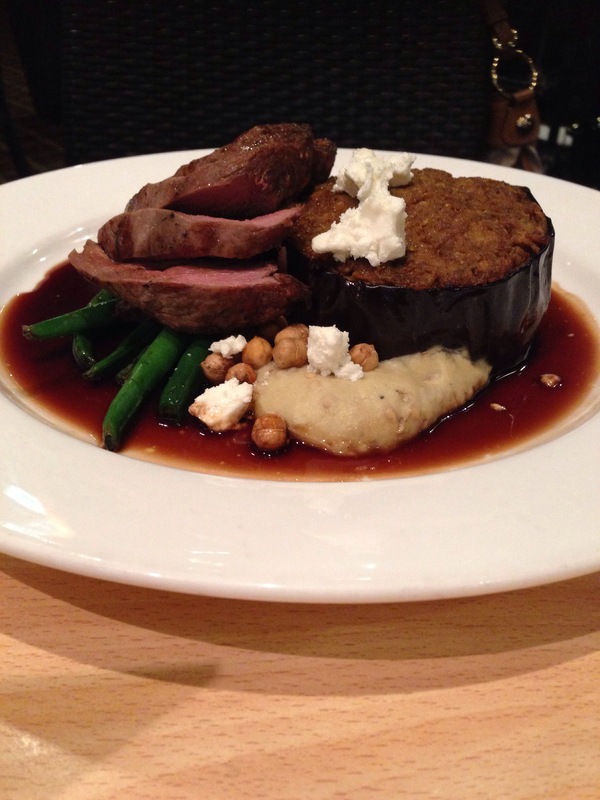 It swam in a lake of lamb jus and among pink slices of thick rump which sat on top of green beans. Small dollops of chickpea and fetta and spicy bubbaganoush (with a bit of tazaiki on the eggplant) made it a Mediterranean experience. The Forwarder couldn’t finish it. The lamb, she said was perfect, the eggplant though was too large and another vegetable substitute may have been a better alternative as there was already bubbaganoush on the plate (which is made from eggplant), and it was a bit of a case of aubergine overkill. Other main courses included pan-seared Atlantic Salmon served with tomato and salmon salsa, fennel and herb salad, confit beets and orange butter ($29); a roasted chicken breast with parsnip puree, braised cabbage, squash, asparagus, baby leeks and Madeira sauce ($28) and crumbed Red Emperor fillets and a seasonal green salad with marinated feta and vine ripened tomatoes, beer battered fries and remoulade ($23). All in all, Lomandara’s is a suburban gem offering a great wine list and some inspirational dishes – some well executed and some needing slight refinement. The verdict: A pleasant surprise and an urban gem. Well-prepared and innovative multicultural dishes from a local club. Gluten-free options and wine matching options is a big tick. A pokie free zone. What: Lomandra’s, 1 Bridgeport Drive, North Lakes, QLD, Phone: (07) 3480-9210. Open for dinner Friday, Saturday and Sunday nights and every day for breakfast (from 7am) and lunch with snacks throughout the day. Ate there: 3 January 2014. This entry was posted in Brisbane, Casual dining, Fine dining, Modern European, Queensland and tagged Brisbane, Lomandra's, North Lakes, North Lakes Golf Club, Queensland, The Hungry Bon Vivant. Bookmark the permalink.